Height: 6' 2" Weight:243 lbs. Background: He is the best defensive player in Saints history. In fact, you would get no argument that he may be the best player in Saints history, with total respect to Drew Brees and William Roaf. Rickey Jackson was a menace, a star from the very beginning. A second-round pick out of Pittsburgh, Jackson started every game in his rookie season and was an iron man, starting every game in every season, with the exception of missing two games in 1989 after being involved in a serious automobile accident. Even then, Jackson missed just two games despite undergoing plastic surgery and having his jaw wired shut for serious injuries. He played with a special helmet, an illustration of just how tough he was. Jackson is second all-time in games played in franchise history with 195 and is the all-time leader in tackles recorded with 1,104, in sacks with 115, in forced fumbles with 38 and in fumble recoveries with 27. For good measure, Jackson added seven interceptions. He was an every down player, good against the run and against the pass and was an elite pass rusher and tackler. His 128 sacks overall still rank 15th all-time in NFL history. He had eight sacks in 1981, before sacks became an official NFL statistic. His 125 tackles in his rookie season were a career high. He totaled 100 or more tackles five times. He recorded 10 or more sacks in six different seasons, including a career-best 13.5 in 1992. His seven fumble recoveries in 1990 led the NFL. He led the NFL in fumble recoveries in 1990 and 1991. If it is possible, Jackson was actually underrated with the Saints. As a member of the famed "Dome Patrol," voted the best corps of linebackers in NFL history, Pat Swilling was the pass rush specialist who led the league in sacks and won Defensive Player of the Year honors in 1991. 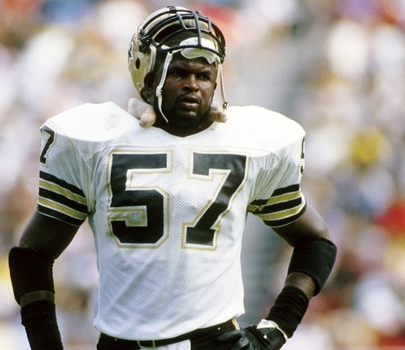 Sam Mills was the captain and leader of the team. Vaughan Johnson was the incredibly hard hitter. Jackson was a primary reason that the Saints made the playoffs for the first four times in franchise history while he was part of the team. Jackson was a great football player and remains beloved by New Orleans Saints fans far and wide. Greatest Moment: There were so many great games for Jackson that it is hard to pick one. In 1986, the Saints were playing at Fulton County Stadium against the hated Atlanta Falcons on December 14. In a defensive battle, the Saints prevailed 14-9. Jackson was a terror, sacking Falcons quarterback Turk Schonert four times, tying the all-time record for mos sacks in a single game in Saints history. He recorded four sacks again on Sept. 18, 1988 at Detroit. In a 22-14 victory, Jackson sacked Chuck Long four times, including once for a safety. Honors: Jackson was inducted into the Saints Hall of Fame in 1997 and he was an inaugural inductee into the Saints Ring of Honor in 2013. 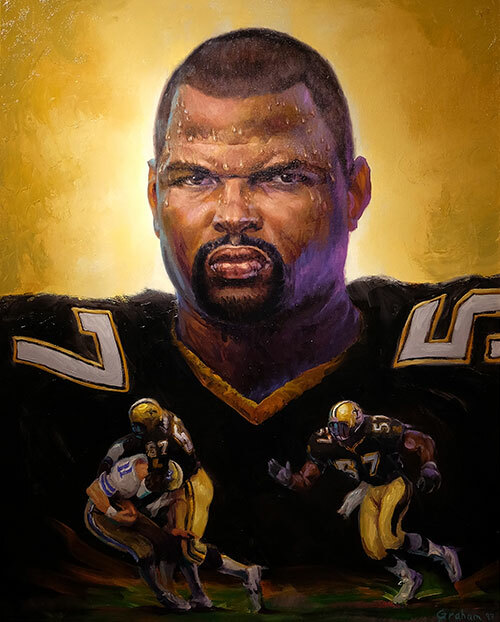 In 2010, Jackson was inducted into the Pro Football Hall of Fame, the first person inducted primarily for his contributions to the New Orleans Saints. Jackson was named to six Pro Bowls (1983, 84, 85, 86, 92, 93). Jackson was named first team All-Pro four times and second team All-Pro twice. Roaf was named to the Pro Football Hall of Fame NFL Team of the Decade for both the 1990's and 2000 decade. Jackson won a Super Bowl with the San Francisco 49ers in Super Bowl XXIX. Jackson was inducted into the Greater New Orleans Sports Hall of Fame and the Louisiana Sports Hall of Fame in 1999.